Saturday September 12- 1931 I was busy about the house most of the forenoon Hattie came with Rob after dinner and took us up to The Englert to a picture show. Walked home. got some things for tomorrow. Evening over at Byingtons. 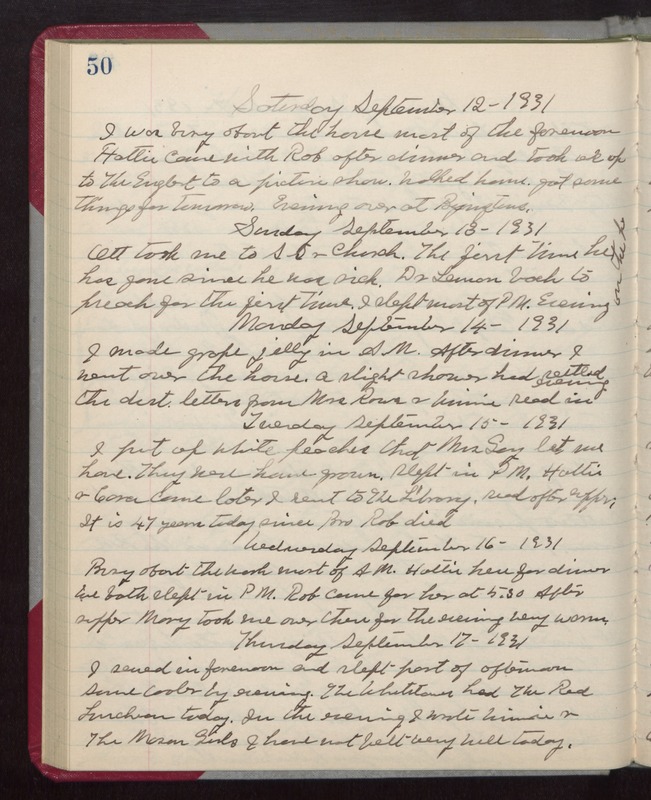 Sunday September 13- 1931 Ott took me to SS & Church. The first time he has gone since he was sick. Dr Lemon back to preach for the first time. I slept most of PM. Evening on the p Monday September 14- 1931 I made grape jelly in AM. After dinner I went over the house. A slight shower had settled the dust. letters from Mrs Rowe & Minnie read in evening. Tuesday September 15- 1931 I put up white peaches that Mrs Gay let me have. They were home grown. Slept in PM. Hattie & Cora came later I went to The Library. read after supper. It is 47 years today since Bro Rob died Wednesday September 16- 1931 Busy about the work most of AM. Hattie here for dinner We both slept in PM. Rob came for her at 5.30 After supper Mary took me over there for the evening very warm. Thursday September 17- 1931 I sewed in forenoon and slept part of afternoon Some cooler by evening. The Whetstones had The Red Luncheon today. In the evening I wrote Winnie & The Mason Girls I have not felt very well today.